Rats! Ive just posted a sunset over kirra beach and was hoping not to be repetitive this time around. Trying to show something a little different than the usual rocks, I have trawled through the archives and have come up with this one at snapper rocks with the surf life saving hut silhouetted in the foreground as the main focal point . For more Sunset/sunrises please go to Eds Sunday stills for a look see. Lovely – the beach hut looks almost like a pagoda in silhouette and that extra streak of orange reflected at the water’s edge is perfect! Great image!! I love the silhouette of the hut against the sunset here- gorgeous contrast! this is beautiful and so peaceful. Opps I accidentally posted my comment here instead of the Sunday stills post. Sorry , Love your photo by the way. 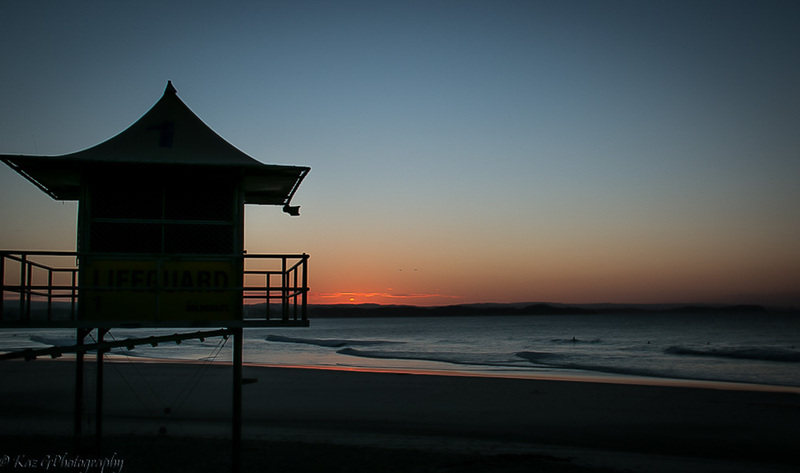 I like the curve of the lifeguard stand against the lines of the beach and sky.